Posted November 29th, 2018 & filed under Culture. At England Logistics, we firmly believe that teams who celebrate together succeed together. With a company so dedicated to celebration that it’s one of our core values, you can only imagine how we celebrate throughout the holidays. To celebrate Thanksgiving, we have a special tradition that allows us to express our gratitude for each team member by enjoying good food together and engaging in friendly competition. To kick things off, the team fills their plates during a company-wide potluck with food that hits on all five basic tastes. Each team member brings traditional and not-so-traditional dishes to share. Eating together as an entire company may sound tricky (and a little crowded), but finding a way to celebrate with everyone together is a special tradition that we cherish. Once our stomachs are full, the team breaks into a bidding war during a live auction. Here at EL, we aren’t strangers to competition. In fact, we encourage competition in almost every aspect of our company. This competition is extra special in that all proceeds go toward benefiting a charitable organization. This year’s auction raised funds to donate meals to hungry children through the One Initiative, EL’s joint effort with C.R. England to fight childhood hunger. Alex, EL’s Learning and Development Specialist, enjoys this tradition for that very reason. Jason Beardall, president of EL, has consistently been the auctioneer at the live auction. His enthusiasm and encouragement are an added bonus to the tradition as he often jumps in to bid on items himself. He clearly has a passion for contributing to the donations and his ability to pump up the team results in exciting bidding wars. 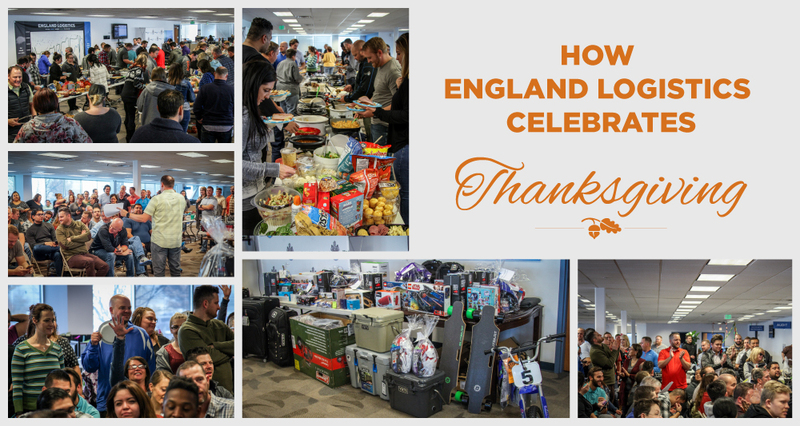 Rachel, a member of the England Carrier Services Tires team, experienced her first EL Thanksgiving celebration this year and was not disappointed. Each team member took in the energy of the auction, often bidding high and coaxing others into doing the same. The friendly competition is a big factor of this tradition, but it’s all in the spirit of giving to those in need. We are grateful for the opportunity to enjoy these traditions and celebrate the season with our incredible team members. From all of us at EL, we hope you had a happy Thanksgiving!